Zotera's Radius is a comprehensive edge computing platform comprised of the Zotera Gateway, Sensors, Actuation & Control Modules, IIoT Analytics, Video Analytics, Device Management, and Data Management. Critical to the success of IIoT is the speed with which data can be analyzed and business decisions taken. Some cases allow only split seconds. The increasing volume of data and the real-time requirements create the need for an evolution in the how this information is processed. Processing must happen at the right place at the right time, and thus a need for real-time analytics to be hosted close to the location where the data is generated. Data thinning through analytics can then strip away all but precisely what is required for decisions and transmitted to a central location in the form of alerts, alarms, and other pertinent information. "Intelligent Gateways" are taking on an increasingly important role in the Industrial Internet of Things (IIoT) connecting legacy systems to new systems, collecting data at the network edge, then acting as a filter to analyze and normalize the data before forwarding it to the next level, or into the cloud. The Zotera Radius Gateway is an independent computing platform deployed at the edge of the network which is capable of acquiring, processing, storing and analyzing data locally, as well as interfacing that data to the Zotera Stratos a cloud-based systems. It offers a way to support traditional data gathering applications (e.g. historian, visualization, SCADA etc.) while opening up a connected facility and assets to the full potential of Industrial IoT. The Zotera Radius Gateway acts as the aggregation point for a group of sensors and actuators to coordinate the connectivity of these devices to each other and to an external network. It offers processing of sensor and actuator data "at the edge" and storage capabilities to deal with network latency and reliability. For device to device connectivity, it deals with the interoperability issues between incompatible devices. A typical IoT architecture would have many IoT gateways supporting masses of devices. The Zotera Radius Gateway is equipped with an Allen Bradley Micro800 PLC & HMI controlling the back end monitoring of physically connected devices. It collects real-time data from IEH attached devices, and IP Cameras, and contains a Virtualized Intel I7 Server, internal switch, router health and the ability to reset remotely. The LRG has the flexibility to connect wired and wireless sensors to the AB PLC developed with Modbus protocols that provides Seamless Integration to AWS, Azure, and IBM IoT Core Cloud Services. With 3 TB of Onboard Storage, the LRG can also store historical data for on demand look up. Remote connectivity is delivered with an integrated 4G router allowing real-time analytics (both video and data from sensors) to be hosted close to the location where the data is generated. The LRG utilizes the Intel Deep Learning Video Analytics OpenVINO technology allowing it to overlay Security Analytics on a Video Management System or just use visual analytics for real time feedback of actionable intelligence. The LRG also enables a Secure WIFI hotspot, and the ability to extend the enterprise network to remote locations without infrastructure and power. 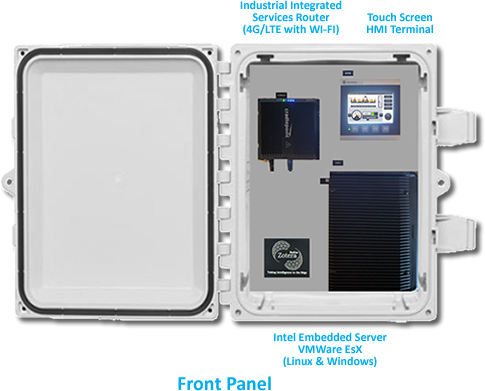 For large distributed environments that require many connected devices in one location we offer hardened Touch Screen devices with built in hardened servers, wireless capabilities, and distributed PLCs to aggregate data to a primary Zotera Gateway for cloud access. These Touch Screen devices may also be deployed for smaller applications with minimal remote compute & analytics requirements such as no video. 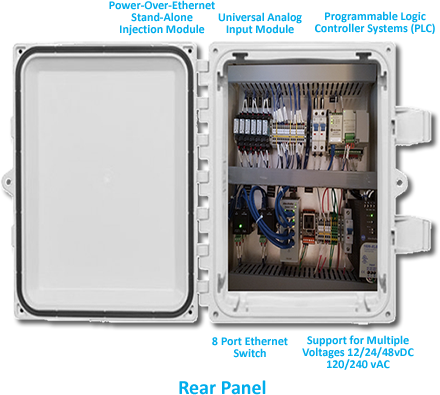 Connectivity to wide variety of sensors - building access, lighting, HVAC monitoring, ventilation, SCADA protocols, etc. The value of Zotera Radius is the ease of deployment for the demanding requirements of industrial IoT & Industry 4.0 environments allowing the use of any sensor hardware and any Cloud Service.